Getting the maximum downloads is what every App developer wish. But getting the same is not an easy task. We have seen a lot of app developers or the companies spent thousands of rupees for the marketing of their app on worthless tactics but have failed disturbingly. Radiant UI –if your app cannot entrap your user, it won’t do much for you also. Consumers are looking for the user-friendly app which can help them in an easy way without investing much time on dingy app. For this one should ensure for the two aspects: first. The UI should be very responsive across devices & Secondly, should be able to delight the customer in the first go. Crash Free App – Every user wants a smooth app. No one likes the buggy app. It should be advised to the developer that to test the app in beta. It should be the utmost priority for a developer before launching the same. There are various platforms that are available for the developers like Betalist, ErliBird, BetaTalks, BetaBound. Poor or fewer reviews may lead to limited fixes to your app, making the complete task futile. Choose the app title strategically – Your app title is very important aspect of your App which leads to the ranking of the App. Make sure that you have included a couple of most important category keywords in your app title. One should make sure that the keywords should fit naturally in the title else it will look spammy. Compact Description – Every business today swears by the name of content and its benefits and app business is not an exception to the rule. Make sure that you write an effective copy to make sure that your app’s purpose is evident. Also, don’t forget to mention the most important benefits your app gives to the users to make their life wonderful or the specific pain points it solves. Reviews & Ratings – Your app’s ranking in the search results is also greatly influenced by the ratings, reviews, and downloads it receives. Indeed, not only the algorithms will boost your app rankings but users will be more tempted to download your app if it has a good reputation. App users rely on other app users’ opinions before downloading an app. An effective technique to encourage users to rate and review your app positively is to use push notifications at the right time. Use localization to get more downloads – There are a lot of non-English speaking countries in the world where people prefer to use apps in their local language. Multiple studies have shown that if you localize your app to languages other than English, it can increase the downloads of your app significantly. If you don’t have the video translated to other languages, you can use YouTube’s transcript feature, and Google Play will use the transcript based on the user’s language setting. Launching at Right Platform – One should showcase an app/product on a platform where it makes sense. A platform that has active users who are really interested in your product. That’s why I am a big advocate of a platform like Product Hunt. Not only will your product get the right kind of visibility, feedback from users will also help you to improve your product and scale well. Play with Pricing & Discounts – Offering an app with a price tag, then a sign-up discount is a great way to entice your current and new users. It will also keep new users from abandoning the app. One thing to note about pricing is to make sure that one must know how your competition has priced their apps and then price an app accordingly. Publicize your App – There are many sites out there which allow you to list your app. Reach out to your power users. Email them, ask them for advice for improvements. If their opinion gets counted, they will feel more inclined to share the app with their friends and family. Make a list of top 500 bloggers in your industry and reach out to them, use Twitter and blog search to find them. Get them writing about the app which will eventually leads to maximum downloads. Periodically Update App – A well-timed refresh of your app is a great way to get your old users using your app again, as well as getting your app re-listed and back in front of potential new users. The right refresh schedule depends on the app, but once a month is a good rate for most apps. Refresh your apps with a new feature or two, some new graphics, a better description, or a new ad network or type (banners, interstitials, etc). 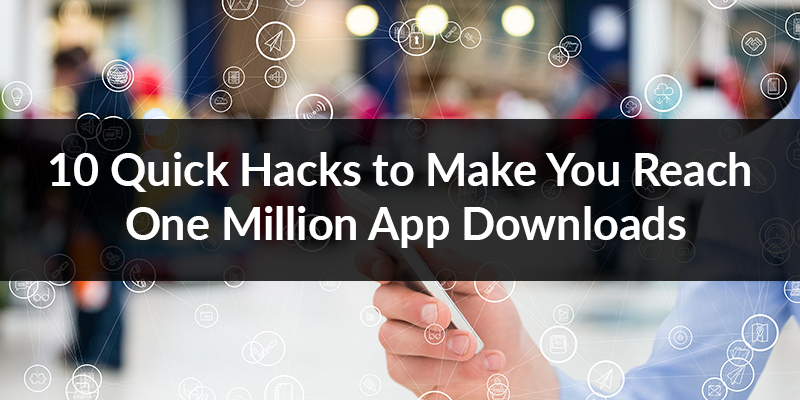 Keeping your app updated is a good idea if you want to be successful over the long term. 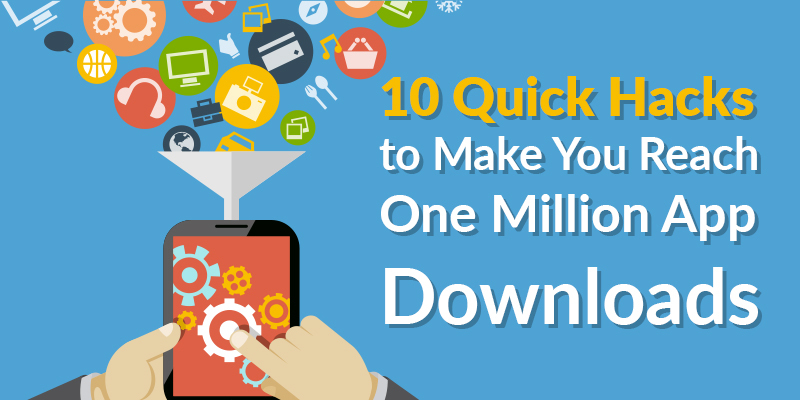 These are some successful hacks one should opt to make you reach One Million App Downloads.